We all use various criteria when selecting wine to purchase. Price, varietal, occasion, food pairing, wine producer, wine growing region and vintage are among the many things we consider when standing in the aisles of our favorite wine retailer or perusing a restaurant wine list. How often do you consider eco-friendly, sustainable practices of the wine producer or wine region in your selection process? I am guessing it is not on your short list of criteria to consider. However, I am also guessing that environmental friendly practices is something you value. We are all conscious on some level about minimizing our carbon foot print as much as possible. 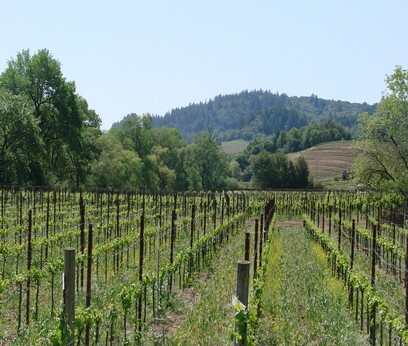 The wine growers of Dry Creek Valley, Sonoma want you to know they care very much about eco-friendly, sustainable practices and are implementing these practices to be a fully sustainable wine region by 2019 resulting in a self-sustaining eco-system AND fantastic wines! A commitment to land stewardship is an integral part of the valley’s farming practices, with a majority of the producers following sustainable, organic and biodynamic practices in the vineyards. 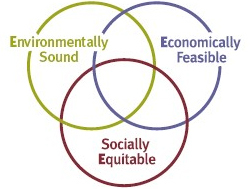 What exactly does it mean to be sustainable in Dry Creek Valley? Dry Creek Valley wineries are working alongside the Sonoma County Water Agency, home owners and US Army Corps of Engineers on a six-mile habitat enhancement project to provide a habitat for the endangered Coho salmon, as well as threatened Steelhead and Chinook salmons. “The project will use boulders, root wads, and logs to create backwaters, side channels, and shady habitats for the young fish that live in Dry Creek during the summer. The project is intended to restore Dry Creek to its original flow and restore the original ecosystem so that wildlife can thrive.” via WDCV. 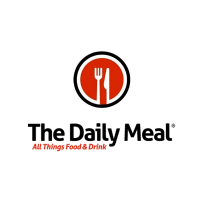 In support of the Winegrowers of Dry Creek Valley’s sustainability marketing initiative I was invited by McCue Communications to participate alongside many all-star wine writers in a virtual tasting of three outstanding Dry Creek Valley wines. Here are my notes on the wines and a bit of information on each winery and their sustainable practices. 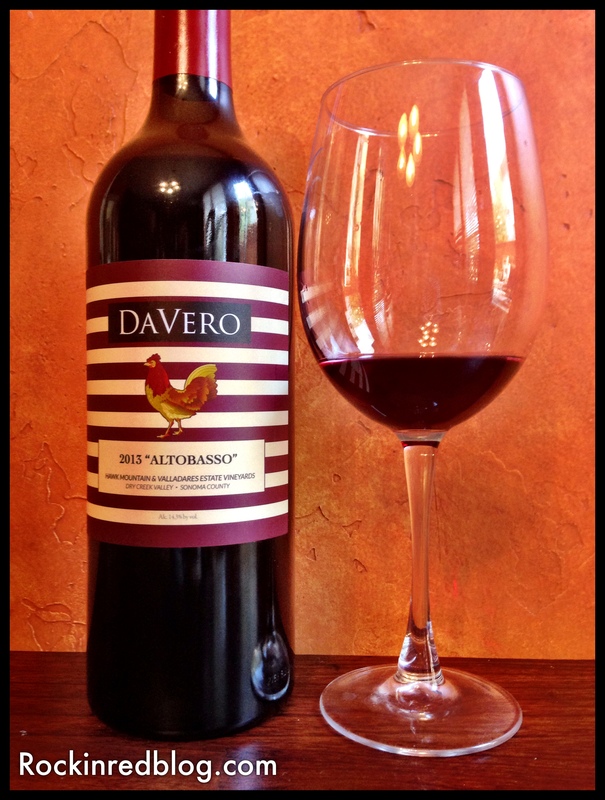 DaVero 2013 “Altobasso” Dry Creek Valley: Crafted of 60% Sangiovese and 40% Barbera; Bright ruby, exotic aroma of bright red cherries, raspberries, sweet spice, violets, green olive tapenade and a touch of vanilla; elegant and delicate on palate with great acidity from Barbera, beautifully crafted integrated flavors; perfect for porch sipping or pair with pork. Slow thoughtful fermentation with native yeasts, then aged 16 months in neutral oak. The Sangiovese grapes come from Hawk Mountain Vineyards (high elevation, “alto”) and the Barbera comes from Valladares Vineyards (low elevation, “basso”); both estate vineyards are certified biodynamic. SRP $65; order direct from DaVero. It started over 30 years ago when we found the land that has become our Home Farm; it grabbed our hearts from the first instant, and has never let go. We lived with the land for years before deciding that what it wanted to grow first was olive trees. So in 1990 we imported olive trees from Tuscany (the first olive trees brought to the US since the 1800s), planted them, and waited. The result is an olive oil that is widely acknowledged as one of the very best in the world. Then, in 2000, we planted our first small vineyard to Sangiovese, and then to the rare and magnificent Sagrantino, and waited. The result is wines that equal the best Italy has to offer, which led us to plant an ever-wider range of Italian varietals. Along the way we embraced Biodynamic® practices, and waited. The result is land that is increasingly vibrant, and now supports olive trees, vineyard, fruit trees, citrus, lavender, produce, and chickens, pigs, and sheep. It all wants to be here. And we are grateful to be here with it. 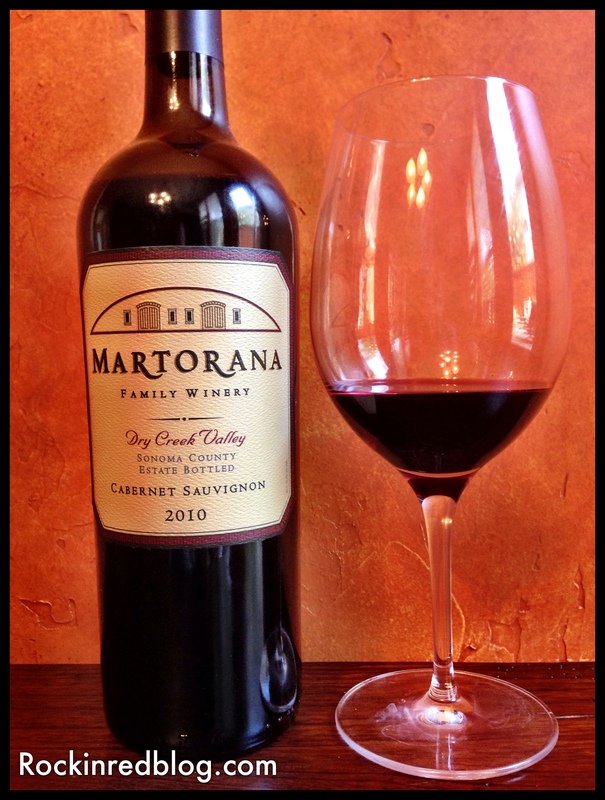 Martorana Family Winery Dry Creek Valley Estate Bottled 2010 Cabernet Sauvignon: Crafted of 80% Cabernet Sauvignon, 15% Merlot, 5% Petite Sirah; Deep garnet, fresh ripe black cherries, black raspberries, plums, spice notes, menthol, leather and oregano on the back of the palate; fruit forward with rich, lovely acidity and chewy tannins. 40% new oak. 15.4% alcohol. “Please pour generously and enjoy with family and friends.” Perfect for an outdoor cook out. SRP $45; order direct from Martorana. 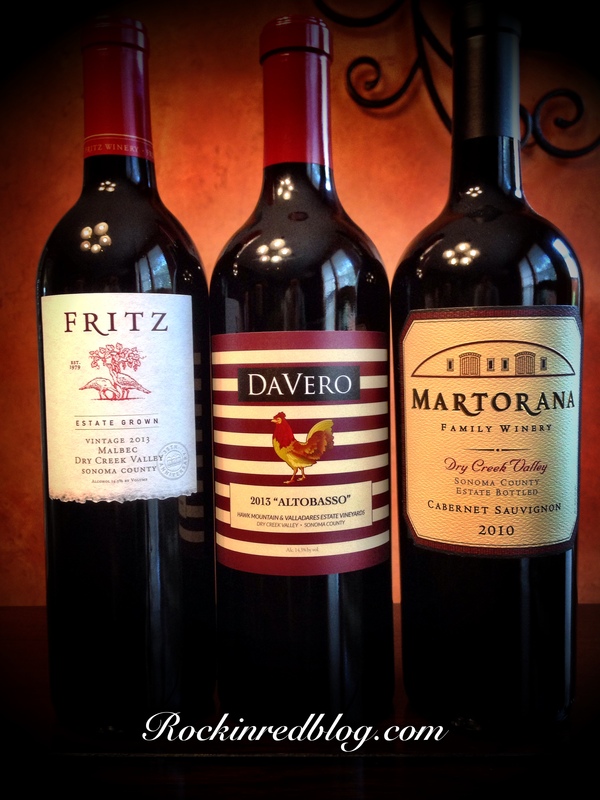 Martorana Winery: For over 30 years, Martorana Family Winery & Vineyards has grown some of the finest grapes in Dry Creek Valley. Family owned and operated, the winery is committed to the preservation of land and natural resources, and practices organic farming techniques that earned a certification from the California Certified Organic Farmers. 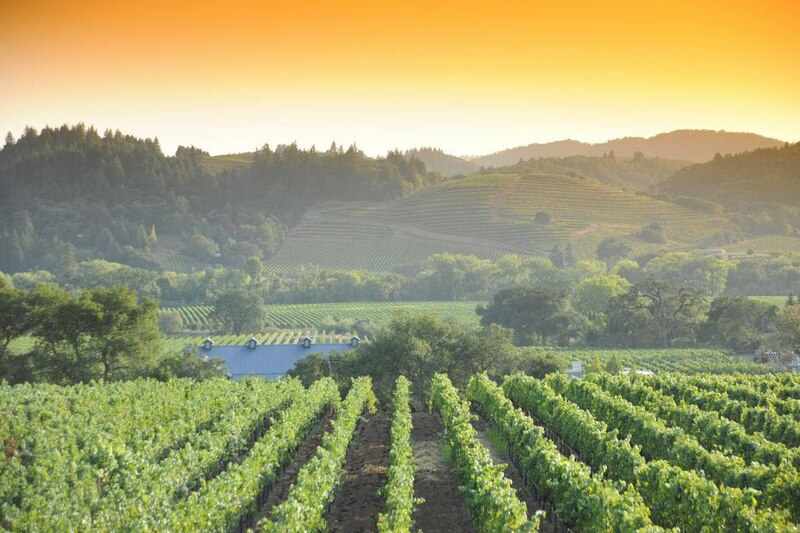 Martorana grapes have produced nationally recognized wines for many of Sonoma’s most notable wineries, as well as Martorana’s own, small production, award-winning Cabernet Sauvignons, Merlots, Zinfandels, Petite Sirahs and Chardonnays. We believe we are stewards of this land, living consciously in harmony with our environment. We employ sustainable farming methods to preserve the soil for the next generation of winegrowers. Our practices extend to the restoration of the Creek for which our Valley is named. In 2014 those efforts earned the Wildlife Stewardship Award from the Association of Fish & Wildlife Agencies. 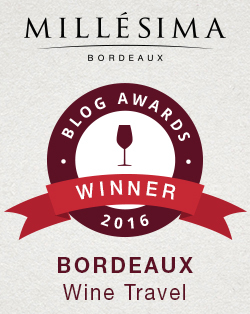 It is the first time this prestigious award has been given to a Winery. 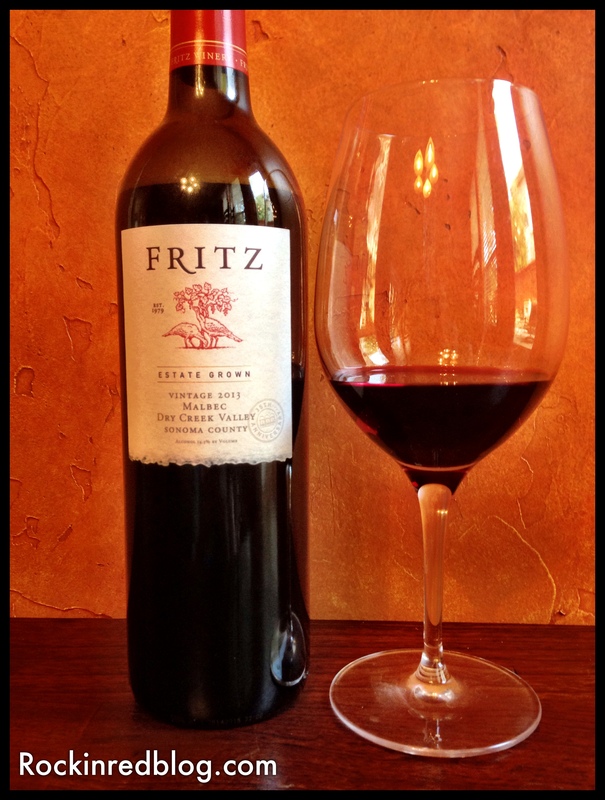 Fritz Estate Grown Dry Creek Valley 2013 Malbec: Crafted of 100% Malbec; Deep violet, restrained dark fruit of black cherry and black berry with red fruit of plums and cranberries combined with spice notes, smoke, chocolate, leather and violets; tart acidity with zippy tannins, full body wine with a dry lingering finish; complex layered wine that continued to evolve after 3 hours open; a superb Malbec for sure. Pair beautifully with lamb or wild game. SRP $45. Order direct from Fritz. Fritz Winery: Fritz Underground Winery is unlike any place you’ve ever visited. A visionary wonder built ahead of its time by namesake Mr. Jay Arthur Fritz in the late 1970’s, this monumental Gaudi style masterpiece represents a viticultural passion for sustainability, quality, and tradition. Today, Jay’s son Clayton runs the winery with the same dedication and enthusiasm to these core values. Built into the side of a picturesque hill atop the northernmost region of the famed Dry Creek Valley, the Fritz Winery operates with a modern sensibility for efficiency and awareness by utilizing the unique attributes of its subterranean design. Naturally cool temperatures, ideal for wine making and cellaring, are maintained without any use of expensive or carbon-heavy devices common to most modern wine production. What’s more, as a three-tiered structure, we’re able to further cut down on energy usage by capitalizing on the always plentiful presence of gravity. By harnessing gravity to move our juice from the crush pad down to the tanks and barrels, we’re not only saving energy by forgoing pumps, we’re also saving our precious juice from the detrimental effects of excessive pulsation and buffeting. I hope you have enjoyed learning about the sustainability practices being implemented in Sonoma County and specifically in Dry Creek Valley. The winemakers understand they are stewards of the land they farm and they seek to leave it to the next generation in at least as good of condition as they found it; hopefully better. So what does sustainability taste like? In Dry Creek Valley, Sonoma County it tastes delicious! 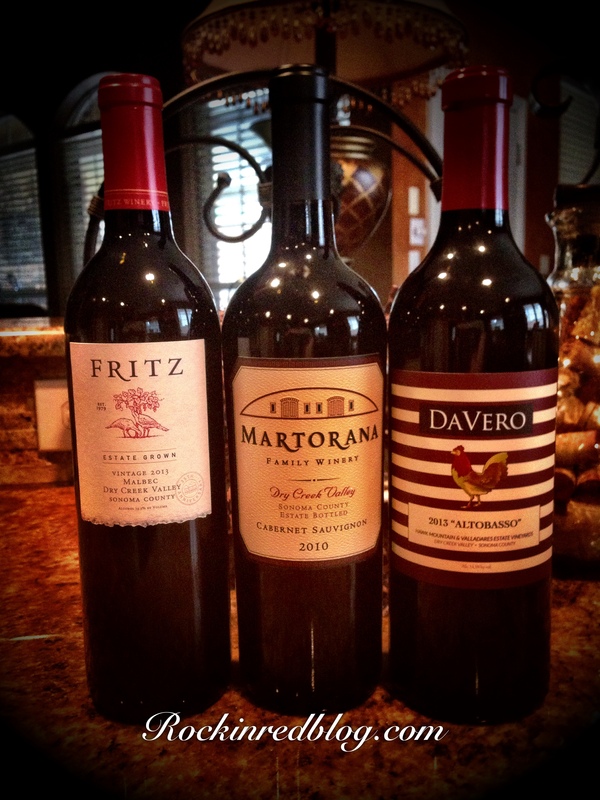 My Song Selection: These three wines were sweet! Not sweet like sugar, but sweet like awesome and WOW! All three were complex, layered, easy drinking and highly enjoyable, plus each one had a bit of rock n roll in the bottle; a wining combination in my book! 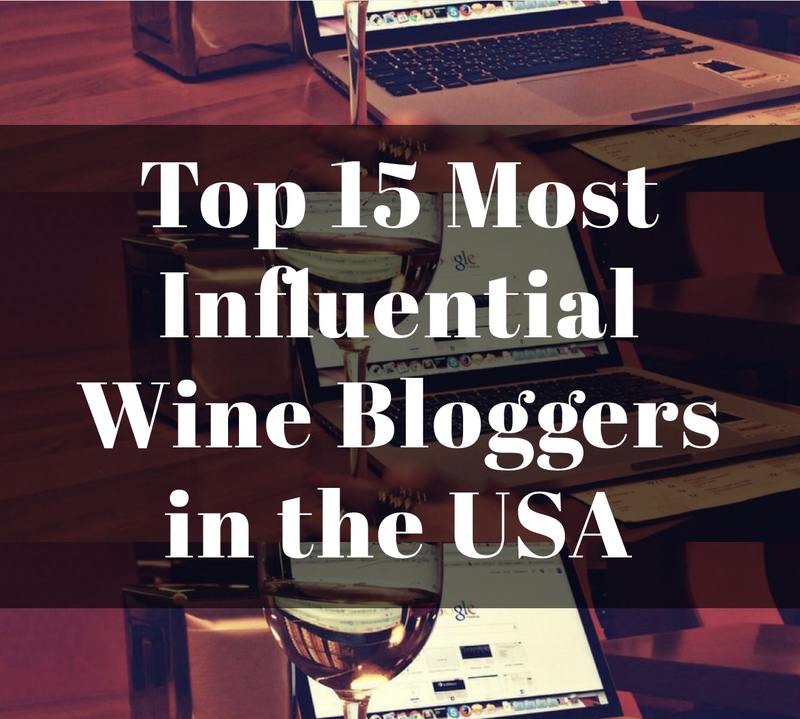 Get your own bottles of Dry Creek Valley wines and let me know what songs you pair with them. Cheers! All three wines so great, but the Malbec has peeked my biggest interest! And awesome song choice! Thank you. The Malbec was a crowd favorite. Cheers. It’s so interesting to see how estates unfold their own values into practice, not necessarily following the consumer or even government guidelines. Most authentic winemakers truly grasp the meaning of Earth-friendly, particularly because the Earth has been so friendly to the wine! In Provence, and other areas of France, sustainability (biodynamique) is a way of life, I’m writing a piece now about an AOC in Provence that honors this philosophy to such a high standard that they are working on making it an AOP mandate… This particular winery, Domaine des Terres Blanches, is one of them… read for an interesting interview. I’ll share the other AOP profile when it’s complete! Thanks very much — I think I may have come across the Fritz but can’t remember… with the Gaudi-style architecture do you find any Spanish influence in the wine? Hi Jill. Thank you for your comments and sharing the link to your article. I do believe the US is behind much of the rest of the world in sustainability; thankfully the wine industry is catching up. Some wine regions, such as Lodi, began with an understanding of stewardship. Others are working their way to the understanding. It is good either way. The Fritz was outstanding but felt very much new world to me so I did not get much Spanish influence. Cheers and happy Friday! Though I try and be environmentally conscious, wine is one thing I don’t actively seek out with that mindset. It’s good to know that good wines can stem from good practices. Nice recap, Michelle. 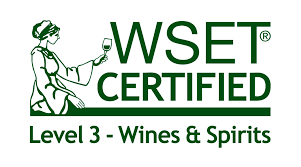 As an avid wine consumer, ‘sustainability’ matters to me. Was great to taste & tweet along with you at the rest of the group. Cheers!